Ahead of what would turn out to be a potentially record-breaking hurricane season, the National Weather Service had 216 vacant positions it could not fill due to a governmentwide hiring freeze imposed by the Trump administration, according to a recently released document. Some of those Weather Service vacancies listed in the document, obtained by the Sierra Club through a Freedom of Information Act and shared with The Washington Post, were in locations that would be hit by the major hurricanes that barreled through the Gulf of Mexico and Caribbean. The Weather Service’s head count finally stabilized in 2016, with the forecasting agency starting and ending the year with about 3,400 on-the-ground workers. But the staffing dip resumed in 2017, falling from 3,425 in December to 3,368 in August, according to data from the National Weather Service Employees Organization, a union representing meteorologists and other NWS employees. The National Oceanic and Atmospheric Administration, the Weather Service’s parent agency, said the hiring freeze played a part in the recent decline in the agency’s ranks ahead of the triplet of intense storms — Hurricanes Harvey, Irma and Maria. “Yes, the hiring freeze was a contributing factor” for renewing that decline, NOAA spokesman Christopher Vaccaro wrote in an email. But NOAA said its forecasting ability was not hampered by the shrunken staff. The Weather Service vacancies that could not be filled because of the hiring freeze, which ended for the agency in April, include two meteorology positions at the National Hurricane Center in Miami. Those posts remained unfilled as of mid-August, the agency said, right before Hurricane Harvey struck Houston. The freeze also prevented the Weather Service from hiring for two meteorology positions in Jacksonville, Fla., one meteorology position in Tampa and an electronics technician in Key West. NOAA said all those posts, each in cities hit by Hurricane Irma, have been filled. Ahead of the storms, the Weather Service readied “preselected backup offices” to handle forecasting for offices in the path of hurricanes in case communication was severed, Vaccaro said. For example, the field office near San Antonio covered the duties of the Key West office when Irma hit. The Miami office stepped in for the San Juan office in Puerto Rico when Hurricane Maria struck. The Weather Service said that 248 positions remain vacant at the agency. Six of those vacancies are at offices in Florida. "I continue to be deeply troubled by the number of unfilled positions at the National Weather Service and fatigued employees working overtime to compensate for these vacancies," Rep. Charlie Crist (D-Fla.) said in a statement. Crist, who served at Florida's Republican governor from 2007 to 2011, added that he shared his concerns with the president earlier this year. The empty desks are not limited to low-level employees. The National Hurricane Center, a Weather Service division, has been led by an acting director since May. An acting career official is heading NOAA until President Trump nominates and the Senate confirms a permanent replacement. Trump has waited longer than any other president to fill that role. The union, however, contends there are actually 665 vacancies at the Weather Service as of July, far more than the agency claims, based on its own Freedom of Information response. In either case, the vacancies at the Weather Service were numerous enough, even before Trump was inaugurated, for the GAO to audit the agency's hiring practices. In May, it concluded that managers and employees “have experienced stress, fatigue, and reduced morale” because of the staff shortages. Because NOAA higher-ups make only “limited information” available on the status of hiring requests to those running Weather Service field offices, managers cannot “effectively plan and distribute workloads,” the internal government watchdog office found. GAO counted 455 open jobs as of September 2016 at the Weather Service, excluding headquarters positions, adding that worker data the agency provided "did not provide an accurate reflection of vacancies." In July, the Senate Appropriations Committee wrote in a report that lawmakers are “very concerned with the continued number of employee vacancies” even though Congress has provided enough money to fill them. "Morale is at an all-time low and these dedicated public servants are exhausted," said Sen. Bill Nelson (D-Fla.), who is not a member of the committee. "The president's hiring freeze only further compounded the vacancies." But if the new administration gets its way, the Weather Service’s budget will not remain as flush. The White House has proposed cutting the agency's funding by 6 percent, which would include the loss of $62 million being used to update weather models and enable the agency to predict changing weather further out. So far, the federal government has received positive marks from the public for its hurricane response. Seven in 10 call the overall response as “excellent” or “good," according to a Post-ABC poll conducted Sept. 18-21. --The Cabinet secretary with a double-digit security team will now have a nearly $25,000 secure phone booth in his office. My colleague Brady Dennis reported that the Environmental Protection Agency signed a $24,570 contract with Acoustical Solutions for a “privacy booth” for head Scott Pruitt. The booth will be completed next month. None of Pruitt’s predecessors in the agency have had a similar setup, Dennis noted. -- More on Pruitt: Like fellow Cabinet secretary Tom Price, the EPA chief's flying habits have fallen under scrutiny too. CBS News reports that Pruitt flew between Cincinnati and New York on an Air Force jet, passing on to taxpayers at least a $20,000 bill. "He then flew to Italy for an international summit that didn't start until three days later, and he left that meeting a day early," the network's Julianna Goldman and Laura Strickler write. "It's unclear why he was in a rush." [A] peculiar confluence of history, legal precedent and regulatory defiance has given California unique authority to write its own air pollution rules. And because 12 other states now follow California’s standards, the state finds itself in an extraordinary position to stage a regulatory mutiny of sorts — with much of the country’s car market in tow. At stake in the dispute between officials in Sacramento, the state capital, and Washington is a measure that the Obama administration estimated would eliminate as much as six billion metric tons of greenhouse gas emissions and save consumers more than $1 trillion at the pump over the lifetime of the cars affected. For now, Scott Pruitt, the administrator of the E.P.A., has said that he will not seek to revoke the federal waiver that allows California to set auto emissions standards... Still, the auto industry has hardly conceded defeat. -- A Republican rebuke on renewable fuels: In yet another sign of a growing rift between Republican senators and the president, Sen. Charles E. Grassley (R-Iowa) went on the Senate floor Tuesday to rip into the Trump administration for weakening the renewable fuel standard. Background: Begun in 2005, the RFS requires refiners to blend ethanol and other biofuels into gasoline and other transportation fuels sold in the United States. In a notice on Tuesday, the EPA outlined a number of options to cut the amount of blending required for 2018 and 2019. Traditionally, the RFS has divided Republicans from oil-producing states, who find the requirements burdensome for companies in their states, from GOP members representing corn-growing states like Iowa, which benefit from the standards. On the campaign trail in Iowa and elsewhere, Trump promised to support ethanol producers. As recently as June, Trump told Iowans, "we’re saving your ethanol industries." On Tuesday, Grassley accused Trump of going back on that promise. "About a month ago, the president even called me to say he still supports renewable fuels and that he will keep his word on the Renewable Fuel Standard," Grassley said on the Senate floor. "He said I was free to tell Iowans of his ongoing support. I’ve gladly done so." "So you can imagine my surprise today," he continued, "when I see that the EPA has released a proposal, out of the blue, to reduce the volume requirements for biodiesel for 2018 and 2019 under the Renewable Fuel Standard. This action today has come out of nowhere." He added, "It’s outrageous that the EPA would change course and propose a reduction in renewable fuel volumes in this way. This seems like a bait-and-switch from the EPA’s prior proposal and from assurances from President Trump himself and Cabinet secretaries in my office." "'It’s very tough, because it’s an island,'" Trump said during a meeting with members of the House. 'In Texas, we can ship the trucks right out there. And you know, we’ve gotten A-pluses on Texas and on Florida, and we will also on Puerto Rico. But the difference is, this is an island sitting in the middle of an ocean. And it’s a big ocean; it’s a very big ocean. And we’re doing a really good job.'" Bump says: "That’s true. Instead, supplies must be transported by airplane or ship instead of by truck. But that’s still not a great excuse for why the island is awaiting supplies." -- Facts on the ground: The island remains mostly without electricity. There are food and water shortages. The faltering Guajataca Dam, which has forced evacuations, has not been inspected since 2013. -- Carmen Yulín Cruz, mayor of the capital city of San Juan, told ABC News about the unbearable heat the residents are facing. "What's out there is total devastation. Total annihilation. People literally gasping for air. I personally have taken people out and put them in ambulances because their generator has run out," she said. -- Here’s a breakdown on the numbers: FEMA and federal partners said they have so far brought in 4 million meals, 6 million liters of water, 70,000 tarps, and 15,000 rolls of roof sheeting, with 7 million meals and 4 million liters of water on its way. It’s still not enough. And from the New York Times, a debrief on the status of the hospitals on the island. The hospitals have been crippled by floods, damage and shortages of diesel. The governor said that 20 of the island’s hospitals are in working order. The rest are not operational, and health officials are now trying to determine whether it is because they lack generators, fuel or have suffered structural damage. All five of the hospitals in Arecibo, Puerto Rico’s largest city in terms of size, not population, are closed. Making matters worse, 911 still does not work, officials said. -- But Trump refused to ease one regulation on shippers. Following Harvey and Irma (which hit Texas and Florida, respectively), the Trump administration waived the Jones Act — which requires all ships transporting goods between U.S. shores be owned and manned by U.S. citizens — for affected areas. The Department of Homeland Security, however, declined to grant an exemption for Puerto Rico, where the law has historically driven up the costs of goods, according to Jones Act opponents. The department argued that the issue wasn't that there weren't enough ships to bring in goods — it was that there aren't enough working ports on the island. The action drew a rebuke from Sen. John McCain (R-Ariz.), long an opponent of the Jones Act, writing in a letter to the administration that he is "very concerned by the Department’s decision:"
"It's an island. We don't just drive trucks and resources onto an island," Long said. "You have to prioritize who accesses the island and what you're sending." Manolo Gonzalez, who owns one of the only restaurants in the village in San Lorenzo, near the river, asked FEMA officials for fuel for his generator, so he could power his ice-maker. He hoped to set up his restaurant as a place for local residents to get ice — particularly his diabetic neighbors who are unable to keep their insulin cold. Other members of the FEMA team helped replace the utility cable stretching across the river with a stronger wire. But that wire was among the only supplies they would be able to leave with the town: They were unable to cross the river. They brought no food or water and had only minimal medical supplies for emergencies. -- About that dam: Every single one of the 38 dams in Puerto Rico has been rated by the Army Corps of Engineers as having a “high hazard potential,” reports The Post’s Steven Mufson. This particular 120-foot Guajataca Dam has not been inspected in four years, and the damage it endured after Maria could put tens of thousands of people in danger. One dam safety expert told Mufson that the time between inspections was surprising. “Since this is clearly a high hazard dam (one for which loss of life is likely if the dam were to fail), it would be typical for an inspection of some type to be done once every one or two years,” John W. France, vice president for the dams and hydropower technical practice of the engineering firm AECOM, told The Post in an email. 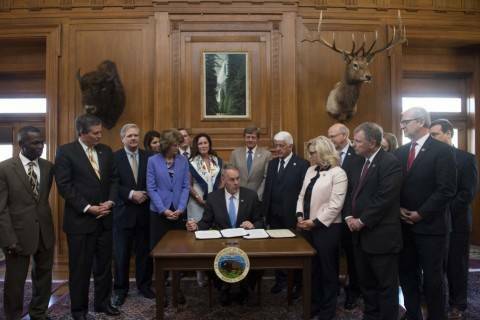 -- It will likely take weeks for a formal aid request from lawmakers for the territory. Politico reported Tuesday that Senate Minority Leader Charles E. Schumer (D-N.Y.) wants an aid package for Puerto Rico and the U.S. Virgin Islands this week. But administration aides are not sure that timeline is realistic. -- And a Republican warns of a potential "Katrina-style event:" Sen. Marco Rubio (R-Fla.) sounded off a dire pleas after his visit to the territory, saying a “more aggressive” federal government response was necessary to help with recovery. "We need to lean into this a lot more than we traditionally would because Puerto Rico's government says their own capacity has been tested by two storms and a fiscal crisis," Rubio said at a news conference on Tuesday. In an interview with Politico, he urged a prompt government response. “What I’m more concerned about in the next 48 to 72 hours is ensuring that we don’t have a Katrina-style event. I’m not claiming that’s where we’re heading. I’m saying I want to avoid that from being even a possibility,” he said. Rubio also expressed concern over the state of area medical facilities. “If you have a stroke or heart attack right now in some remote part of Puerto Rico, you’re probably going to die. There’s no cath labs or open heart surgery happening. I hate to sound alarmist. But having lived through multiple storms and knowing what it’s like in overdeveloped communities 72 hours after there’s no food or fuel or electricity, imagine being isolated like that for weeks,” Rubio said. -- As for the status of Maria itself, which was downgraded to a tropical storm on Tuesday afternoon: The storm is expected to slowly move away from the U.S. East Coast in the next day or so, the National Hurricane Center reports. With the latest advisory, the storm was located 145 miles east of Cape Hatteras, N.C. with 70 mph maximum sustained winds. Storm surge flooding is expected, “especially along the sound side of the North Carolina Outer Banks,” according to the hurricane center. The storm is expected to erode more than half of the sand dunes along North Carolina’s coast, the Associated Press reports, and beaches in Maryland and Virginia “a could fare even worse, with two-thirds seeing erosion and the ocean washing over the dunes on one-third of them.” Officials estimated about 10,000 to 12,000 visitors evacuated North Carolina barrier islands of Hatteras and Ocracoke ahead of the storm. "I got 30 percent of the crew that’s not loyal to the flag,” Interior Secretary Ryan Zinke said in an address to the oil industry. Clinton pressed Trump to deploy hospital ship Comfort to Puerto Rico. Now it's preparing to go. 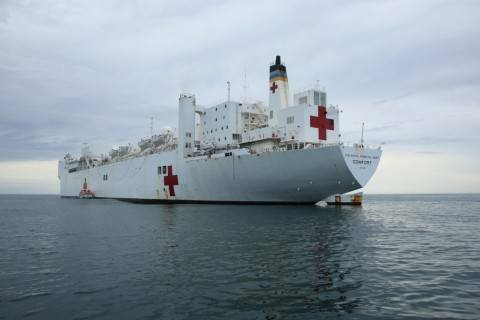 The cry for the USNS Comfort appeared to stand in as a symbol for something broader. -- Would it surprise you to hear that this hurricane season broke a record? September has produced the most ACE — or Accumulated Cyclone Energy — on record in the Atlantic Ocean. ACE, Matthew Cappucci writes for The Post, is a measure of every hurricane’s energy put together during its lifespan. The Wilson Center’s North America Energy Forum. The Congressional Advanced Energy Storage Caucus holds a briefing with Reps. Chris Collins (R-N.Y.) and Mark Takano (D-Calif.) on the U.S. energy market and electric infrastructure resilience. The Environmental Markets Association annual meeting begins. President Trump says "Puerto Rico is going to need a lot of money:"